What’s the use of a dynamic pricing plugin? In the present scenario, the significance of a Dynamic Pricing and Discounts plugin cannot be left unnoticed. Every store owner finds the need to sell his products at discounted rates at some point in time. The reason of providing discounts can either be the direct measure of boosting sales or as a means to say thank you to the customers. Offering different discounts to different customers and giving out free gifts are one of the most straightforward ways to give special privilege to the loyal customers. Along with the persuasive discounts and prices, the right theme would ultimately compel the customers to keep coming back to your store. How to configure the dynamic pricing plugin? Now, if you are using ELEX Dynamic Pricing and Discounts plugin for WooCommerce alongside the Kalium theme, you have already helped yourself with one of the most effective combination. Here’s a brief overview on how to configure the plugin and how Kalium theme would beautify the plugin at the front end. After installing and activating the plugin, click on “Settings”, this would redirect you to the “Product Rules” tab. If your purpose is to configure discounts to just a particular product and not a category or the entire cart, then you can setup the rules right under this tab. In the above screenshot, two rules have been configured for a particular product. The selected product is having a regular price of $1000. Both of these rules are based on “Quantity” (no. of units of the item). Likewise, the rules can also be configured based on “price” and “weight”. 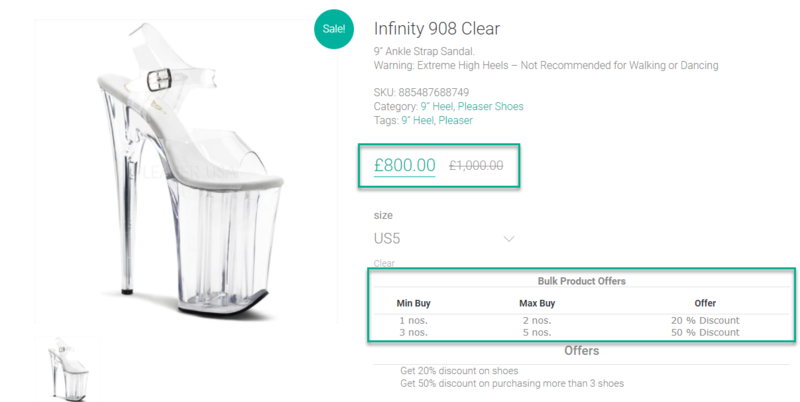 The discount type is configured as “Percentage Discount” which would calculate the percentage to be discounted based on the original price of the product. Likewise, the rules can also be configured for other discount types like “fixed price” and “flat discount”. For the purpose of simplicity, only the mandatory fields have been filled in this example. Thus, when a purchase of 1-2 units would be made, the per item price would be $800. When 3-5 units would be purchased, the per item cost will be$500. How the shop page displays the discounted items? Notice that the regular price is displayed with strikethrough, alongside the discounted price. How does the product page look like? The display of discounts in this page is highly dependent on the theme. Every theme would have its own style to convey the discounts to the customers. The Pricing Table is displayed under the “Bulk Product Offers”. This table displays all the available product rules for the particular product. This is one of the most striking feature of the plugin. This would easily convey all the discount information to the customers. The position of the pricing table can be changed as per the requirements. Kalium theme has an elegant way of displaying the pricing table which can never escape your customer’s attention. The “Offer Name” that you have given to the discounts in displayed under Offers. 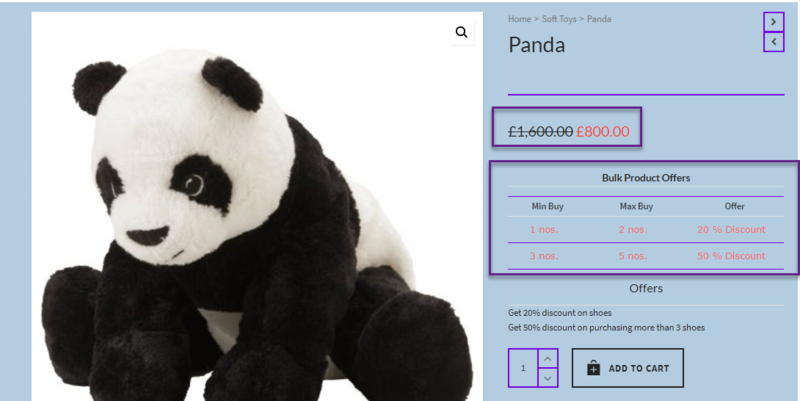 This feature gives you more control over conveying the discount information to your customers. How does the cart page look like? When, 1 units of the product is selected, the per item price gets updated to $800 with a strikethrough over the regular price of $1000. Similar to setting up Product rules, setting up Cart rules, Category rules and Combinational rules are equally straightforward. That’s it! your store is now ready to drive your customers through its appealing design and persuasive prices.